Georgie We Have A Problem. 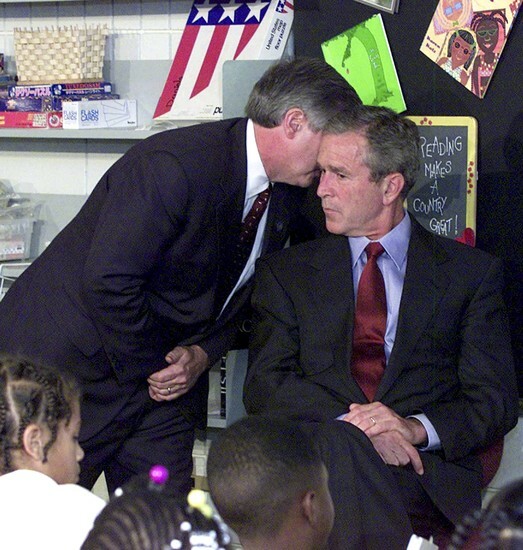 George Bush was in the middle of reading to a group of elementary school kids when his Chief of Staff Andy Card whispered to him about the events that had and were taking place. The events of that day would leave a bad taste in his mouth and the nation's alike for the rest of time. Sometimes The Only Way To Look Is In. The events that occurred on 9/11 will forever be remembered in the minds of any american cognizant or old enough to remember it. Never had we been attacked on our own land like this. Yes there have been some incidents but this one was major. 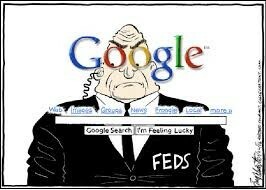 The government had to radically changed the way they viewed the American public. Those in charge of collecting data would have to look past and do away with restriction that previously kept them from 'intruding' in on the privacy of citizens. This was necessary to keep the nation safe. 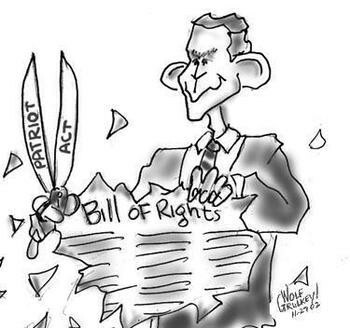 The answer to our new problems and the new world we lived in would be the PATRIOT ACT. We could no longer keep the nation safe with measures currently in place. The CIA was now in a position where they could delegate power and also use some to keep the nation safe while keep the FBI in the loop. The Providing Appropriate Tools Required to Intercept and Obstruct Terrorism Act of 2001 or PATRIOT Act for short, was not the original name or ideas. The first answer to the problem was the Combating Terrorism Act of 2001. This was the first bill actually proposed. The bill was finally drafted by Jim Sensenbrenner. In the draft he talked of basically the new powers that the government had to survey the people and watch the influx of immigrants. Ironically enough he now is a big opponent of the act. When it comes to giving them more power, you did not have to tell the government twice. The president fot the final draft very quickly and bam his signatured signed it into existence. The president himself did not really have to think twice about it either. The nation was so riled up that they were all in full support of the bill. They thought this would be the key to solving the problems of terrorism on American Soil and as desperate times call for extreme measures they passed this bill with no problems. As the bill came into being a whole new slew of technological tools were put into play. This includes but is not limited ghost ip address locators, unmanned aeronautical devices (drones), even old school wiretaps, just done much better. The freedoms of those inside our borders were downplayed as it was for the greater good of the nation. The government went seemingly no huddle into this one and was very quick to act. As soon as November 9th, 2001 (yes less than a month later) the action was taken to interview over 4,000 men who had came to the U.S. from specific countries. This did not apply to just any men they had to be ages 18-35 and also their date of immigration had to be on or after. 1/1/2000. The next major action came on 11/13/2001 when Bush himself allowed those who had been accused of terrorism to be tried in military courts which are nothing like civilian courts. There are much less rights and not really any protections. The next thing to do was to go on raids call "Operation Green Quest" where the U.S.C.S went to the homes and business places of islamics and took items that might lead to or facilitate terrorism. Was this ok? Most non-muslims think yes. It was time to put this policy into action, and that is exactly what the government did. To date 27 terrorist plots have been stopped. Thats 27 9/11's that did not happen. That's 27 steps in the right direction. The cells around the world but especially in America have come under the most intense scrutiny from the FBI, CIA and overall the whole federal government. Even though the Act may overstep a few boundaries we used to have it is effective. It really is. Some may argue that it is an unacceptable invasion privacy but the greater good will always outweigh the wishes of few.